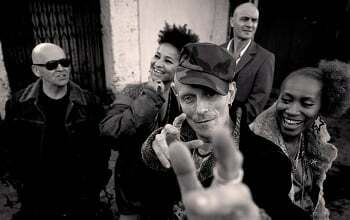 Stereo MCs are a British rap group formed in 1985 in London, England. The group consists of Rob Birch (vocals), Nick ”The Head” Hallam (turntables, production), Cath Coffey (backing vocals) and Ian ”Owen If” Rossiter (drums). They are best known for their 1992 single ”Connected” which was a major hit in the United Kingdom and the United States, as well as a crossover success on American alternative rock radio. Rob B, the indomitable front man behind arguably the biggest selling hip hop group the UK has produced to date, is a man ready to let the music do the talking once again. Brit Awards (x2), Mercury Music Prize shortlists and world tours – all these are of little relevance to the Stereo MCs today, in 2005, on the cusp of releasing their opus to freedom and 5th studio album ‘Paradise’ on their brand new Graffiti Recordings imprint. Rob Birch and Nick Hallam met in Nottingham in the mid-80s before relocating to London, forming the first incarnation of Stereo MCs and producing debut album ’33 45 78’ – a labour of love that involved hand-making drum loops in the most rudimentary of studios and crafting the blueprint for their sound. It was undoubtedly a raw record, but utterly original, drawing the attention of the likes of the Jungle Brothers who would soon feature in a star turn on the second album ‘Supernatural’, released in 1990. By creating a very British take on a very American discipline, influenced as it was by the rising tide of acid house as much as Public Enemy and the early rap pioneers, Stereo MCs had created what no British group had managed before – credible Hip Hop from London able to appeal to the masses. Touring their most successful album to date, 1992s chart smash ‘Connected’, with the likes of U2 and Happy Mondays cemented their position as musical icons of the 90s, and with sensational live shows, celebrated mix albums and increasingly high DJ profiles, it was not until 2001 that the band’s fourth LP ‘Deep Down and Dirty’ was released amidst a whirl of expectation. If there’s one thing that is certain about the Stereo MCs, they are a band very much influenced by their surroundings, in need of being comfortable within them and in control of them both on an immediate and wider scale. Now, from the studio base affectionately referred to as their ‘front room’ (also coincidentally slap bang on Brixton’s frontline, just to give you a less congenial feel), Nick and Rob, writing again with a refreshed sense of creativity, have conjured yet another beautiful step in their continuing evolution as a band. Retaining their trademark throbbing bass bounce and injecting a healthy dose of soul, its unmistakably a Stereo MCs album but their liberation from the major label shackles has dusted the whole affair in a laid back optimism that was perhaps notable by its absence on Deep Down and Dirty.